Hank Williams, Jr. spent his early career in the long shadows of his late father, the most legendary figure in the history of country music. Pressured to imitate his father’s sound, the young Hank Jr. found himself personally and artistically frustrated. It took intense personal struggles and a nearly fatal accident to set him on a new course in which he boldly expressed his own musical vision. Combining traditional country with Southern rock and blues, he has crafted a highly original sound that has garnered him 10 number-one singles, 20 gold albums, 6 platinum albums, 4 Emmy awards, and 5 Entertainer of the Year awards. Randall Hank Williams was born on May 26, 1949, in Shreveport, Louisiana. His father was Hank Williams, the 25-year-old country-music sensation who was enjoying a huge hit at the time with “Lovesick Blues.” His mother was Hank’s wife and sometimes singing partner, Audrey. 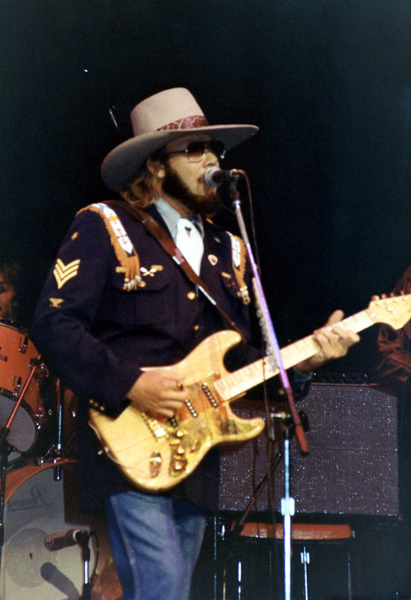 Hank Williams, Jr. on stage during one of his many concerts. Hank Sr. was a regular performer on the Louisiana Hayride radio program, based in Shreveport, during this period. 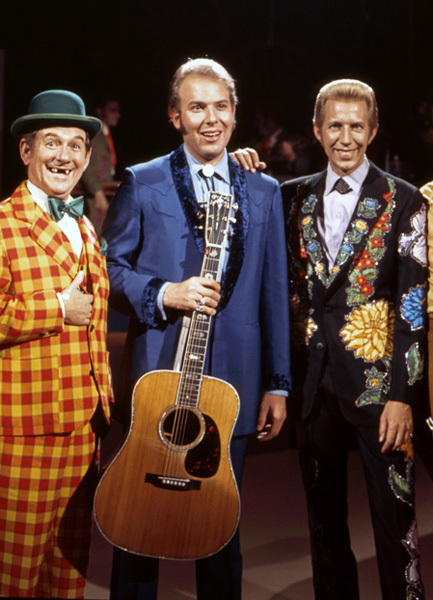 He took to calling his baby boy “Bocephus” after the ventriloquist dummy used by Grand Ole Opry comedian Rod Brasfield. In the early hours of New Year’s Day 1953, Hank Sr. died in the back seat of a Cadillac on his way to a show. His death was most likely caused by a combination of alcohol and painkillers, which he took for back pain. The deeply troubled but truly brilliant singer and songwriter was only 29. His son was not yet 4. Audrey decided to try to turn her son into a little version of his dad. He began performing his dad’s songs in shows when he was eight years old. He signed his first record deal at age 14 in 1963, earning a number-five hit the next year with a remake of his father’s “Long Gone Lonesome Blues.” Also in 1964, he recorded the soundtrack for the movie biography about his father titled Your Cheatin’ Heart, starring George Hamilton. Hank Jr. performing his dad’s “Jambalaya” on Porter Wagoner’s television show around 1965. 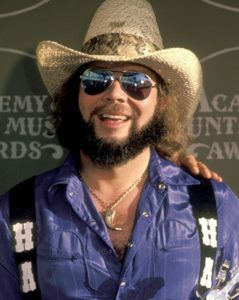 Teenaged Hank Jr. began to show his own personality with his self-penned song, “Standing in the Shadows (of a Very Famous Man),” which reached number-five on the country charts in 1966. He scored his first number-one hit in 1970 with “All for the Love of Sunshine,” recorded for the Clint Eastwood movie Kelly’s Heroes. He had another number-one with “Eleven Roses” in 1972. Hank Jr. released a soulful version of Tony Joe White’s “Rainy Night in Georgia” in 1973. These and other songs he recorded at the time showcased his strong voice but had no particularly memorable or unique style to them. By the early 70s, he found himself struggling with alcohol and drug abuse—seemingly on a downward spiral similar to that of his late father. He even attempted suicide before he finally realized that he had to take hold of his life and career and move them both in new directions. He left Nashville and moved to Alabama to start over. His 1975 album Hank Williams, Jr. and Friends was his first honest effort to express his own musical creativity. This is where he first mixed Southern rock and blues with country, inspired by such groups as the Allman Brothers Band, the Marshall Tucker Band, and Lynyrd Skynyrd. 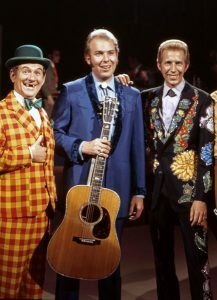 Hank Williams, Jr. with Porter Wagoner and Speck Rhodes on the set of Porter Wagoner’s TV show. After recording this milestone album, he went hiking and mountain climbing in the Montana wilderness. On August 8, 1975, while climbing Ajax Mountain, he fell about 500 feet. He sustained multiple skull and facial fractures but managed to survive—though he required a series of reconstructive surgeries, which substantially altered his appearance. The accident reinforced his determination to live life on his own terms. Hank’s 1979 albums Family Tradition and Whiskey Bent and Hell Bound yielded the now-classic title songs. The latter album also featured a duet with Jennings called “The Conversation,” which referred to Hank Sr. as “still the most wanted outlaw in the land.” These albums were the first of 17 straight gold or platinum albums through 1992 for Hank Jr.
Hank Jr. performing his signature song “Family Tradition” in 1982. He also had successes with new versions of his dad’s “Mind Your Own Business” (with Willie Nelson, Reba McEntire, Tom Petty, and Rev. Ike) and “There’s a Tear In My Beer” (made into an award-winning video that appeared to show Hank Jr. and Hank Sr. singing side by side). The year 1987 was the first of five times that Hank was honored with Entertainer of the Year awards by either the Academy of Country Music or the Country Music Association. Father and son singing “There’s a Tear In My Beer” together, thanks to the miracle of video technology combining 1951 with 1989. Hank stayed in that role until 2011, when ESPN officials expressed displeasure at his outspoken political views. ESPN brought Hank back for Monday Night Football in 2017 with a new version of the theme song, which also included Florida Georgia Line and Jason Derulo. The official video of “All My Rowdy Friends Are Coming Over Tonight,” featuring a who’s who of country music celebrities circa 1984. Although Hank Jr.’s chart successes began to slow down in the 1990s, he has continued to produce some artistic gems. In 1996, the Three Hanks: Men with Broken Hearts album featured a collection of songs in which Hank Jr. sang with both his father and his son—Shelton, known as Hank Williams III. Hank III has since become an accomplished and unique artist who can easily move from hard-core honky-tonk country to heavy metal. Hank Jr.’s daughter Holly is also a successful singer and songwriter. One of Hank Jr.’s most outstanding later albums has been 2002’s Almeria Club. This superb set revealed the depth of Hank’s blues soul and musical talent perhaps better than any album of his career. It also included a defiant response to the 9/11 terrorist attacks titled “America Will Survive” (based on his earlier “A Country Boy Can Survive”). Hank Jr. playing “Last Pork Chop,” from 2002’s Almeria Club. In addition to performing music, Hank Jr. continues to speak out on political issues he cares about, often involving Southern pride or the rights of gun owners. He is a frequent performer at National Rifle Association meetings. More about Hank Williams Jr.
Hank Williams, Jr., with Michael Bane. Living Proof: An Autobiography. G.P. Putnam’s Sons, 1979.